With thousands of combinations of label material, adhesive and coatings, we can match your needs to the perfect custom label. Jet Label’s years of experience providing labels and tags for airlines and logistics companies makes us fully qualified to supply you with labels that will stand up to harsh environments during travel. Moisture, temperature, and debris are no obstacle for your label application. No matter the job, our team at Jet Label can set you up for success with their eye for detail and knowledge of the industry. From our designers to planners to press operators, we’ll treat your label with care and consideration until it arrives at your door. Thanks for your great quality products and customer service. Crucial for a company like us. We trust you. From baggage tags and cargo labels, to boarding passes and parking tickets, we solve your labeling needs with overnight shipping, custom printing, and innovative design to reduce errors along the journey. With our subsidiary company, Jet Marking Systems, we offer a full solution for marking your products along their journey. We’ve partnered with the best manufacturers in the world to provide you with scanning solutions, thermal printers, industrial inkjets, RFID and more for all your coding and tracking/traceability requirements. 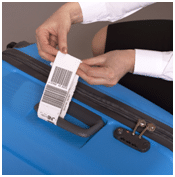 Thinking of introducing RFID to your baggage tags? We do that. RFID enables Better Tracking: A baggage tag that contains a RFID tag allows a transportation company to track luggage more effectively. The most common process at this time relies on a barcode system which requires tedious scanning. Here’s the impact the RFID tag system can have on the airline industry.